Dozens of different viburnums (Viburnum spp.) exist. Most are deciduous shrubs with attractive, often fragrant white flowers in spring, followed by red-to-purple fruits and colorful foliage in the fall. 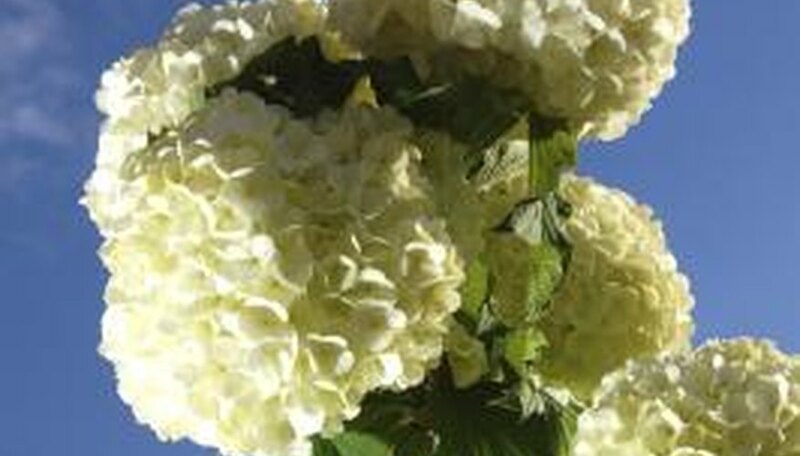 Although they usually grow naturally into well-formed plants, with varieties ranging in height from 2 to 30 feet, some pruning might be in order to shape a viburnum or to keep its size within bounds. Choosing the best time for trimming can help ensure a good result. You can prune a viburnum in late winter or early spring, before new growth appears. With this timing, cuts you've made to its branches heal quickly as soon as the plant starts growing, while insects that might attack the fresh wounds are mostly still dormant. But a viburnum blooms on "old" wood -- this means branches that grow during the summer develop flower buds for the following spring. If you trim a plant in winter or early spring, you'll remove some of these flower buds and lessen flowering for the current season. To preserve the spring blooms, you can trim the plant in late spring or early summer, shortly after it drops its flowers. This pruning schedule leaves enough time for new growth with buds for the following spring's flowers to develop before winter arrives. Although you can remove damaged branches or trim a small twig or two on a viburnum at any time without risk to the plant, it's best to avoid any major pruning during late summer or early fall. Whenever you cut back stems, the plant receives signals for new growth and, in response, sends out tender young shoots at cutting points. Most viburnums are hardy, frost-resistant plants -- for example, the arrowwood viburnum (Viburnum dentatum) grows in U.S. Department of Agriculture plant hardiness zones 3 through 8 -- where colder parts of its range can experience winter temperatures below 0 degrees Fahrenheit. If you prune in fall, cold winter temperatures can damage new growth, potentially harming the plant and slowing its growth the next season. The best trimming method depends partly on your goal. If the shrub just needs a bit of shaping, cut back overly long branches or any that are growing in an awkward direction. You can also help determine the direction of new shoots by cutting just ahead of a bud or side branch that's facing where you want new growth to appear. For example, to help fill an empty spot, cut just ahead of a bud that's facing toward the space. If the viburnum has become too large or is old and needs renewing, you can cut back about a third of its branches the first year, repeating the process for the next two years until you've trimmed the entire shrub. Make slanted cuts at the desired length with a pruning shear or knife, wiping your blade with rubbing alcohol between cuts to prevent spreading plant diseases. After you've trimmed a viburnum, keeping the plant well-watered helps stimulate new growth and avoids stressing the shrub. Provide supplemental water during dry spells, aiming for one inch of water weekly, including rain. Adding a layer of compost also helps increase the fertility of the soil. Spread compost on the ground under the plant, as far out as the edge of its canopy. Next, add a 2-inch layer of mulch such as straw or shredded bark, to help conserve soil moisture and keep down weeds that compete for soil nutrients.